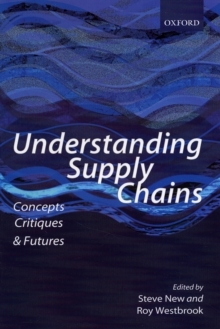 The Supply Chain concept is one of the most important ideas to emerge in management research and practice in the last twenty five years. Organizations do not exist in isolation. Any organization, whether a large corporation, public body, or small business, which aims to meet the needs of its various customers and stakeholders will need resources in order to do this, and will acquire many of its materials, equipment, and supplies from other organizations. The performance of an organization is thus influenced to a greater or lesser degree by the actions of the organizations that make up the Supply Chain. There is no doubt that the emergence of Supply Chain Management has been a major development in management thinking and practice. It has become an established feature of management education, and a professional field with its own magazines and journals - a field with its own distinctive perspectives. However, many writers observe that it is a field characterized by imprecise terminology, sloppily applied metaphors, and conflated or confused concepts. The slightest skim of the many literaturesthat use the term reveals a wide range of interpretations, hundreds of different formulations, nuances, and taxonomies for the 'Supply Chain', and dozens of near synonyms. The purpose of this volume is to bring together insights from the leading researchers and thinkers on supply chain management to help move the field forward. It provides a survey of the key theoretical concepts which underpin the field, and presents critical evaluations of the underlying ideas and approaches. It will be an important resource for those active in researching in or applying the ideas of supply chain management, and for advanced students and their teachers.